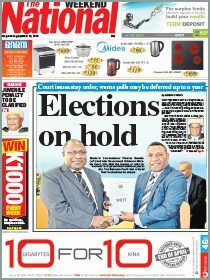 A SPONSOR has extended its memorandum of understanding with the Papua New Guinea Rugby Football League (PNGRFL) for three more years, ensuring the governing body continues developing the sport nationwide. The MOU will see WR Carpenters Group of Companies continue to be the ‘wheels for rugby league’ in the country since the establishment of the partnership in 2013. The MOU was signed by PNGRFL chairman Sandis Tsaka, chief executive Reatau Rau and WR Carpenters Group of Companies country manager John Mangos at the National Football Stadium in Port Moresby yesterday. 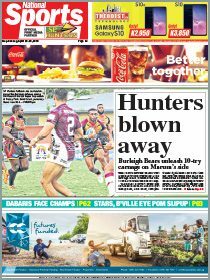 Tsaka said the sponsorship — through the Boroko Motors Limited brand — would benefit the programmes under the PNG Hunters, Kumuls, Orchids, women’s rugby league and the national schools competition. “This is a significant partnership with WR Carpenters Group of Companies,” he said. “Through one of their brands, Boroko Motors Ltd, they have been partners with PNGRFL since 2013. “They supply all the transportation needs for all our six-tier programmes from Lig Blong Laif, National Schools Rugby League, affiliate competitions, Digicel Cup, Hunters, Kumuls and the Orchids. “Boroko Motors is a great partner because of the support they provide in terms of transportation. Tsaka thanked WR Carpenters Group of Companies for continuing to support rugby league development in the country. “We look forward to working with you over the next three years,” he told Mangos.